The 10 Best Yoga Studios in New York! For centuries, yoga has been a means to achieving both physical fitness and inner peace. New York State has a diverse assortment of spaces to improve your practice, from woodsy Catskills retreats to dark, glowing Manhattan studios. Here are 10 excellent yoga studios around the state. This bright, spacious yoga studio promotes positive thinking in each of its New York City locations. The instructors are passionate, the harmonium is often played during class, and beautiful art adorns the space, helping you find your Zen. Offering a variety of Ashtanga power yoga classes, outdoor yoga classes, yin yoga, and sunrise yoga. The studio runs a teacher training program and has $8 community classes on Tuesdays and Thursdays. With a focus on traditional yoga asana from India, Woodstock Yoga Center teaches Iyengar, vinyasa, yin, and restorative classes, and runs retreats at its pristine studio in the Catskills. This welcoming community of yogis in the Hudson Valley offers vinyasa, gentle, and power yoga classes with a focus on Iyengar Yoga—the emphasis of proper alignment, support, and stability. A soothing, tranquil space to practice, Pure Mountain Yoga’s location is enough to put students at ease. The Catskills studio’s instructors teach a lineup of vinyasa, all-levels, and kundalini-style yoga classes. 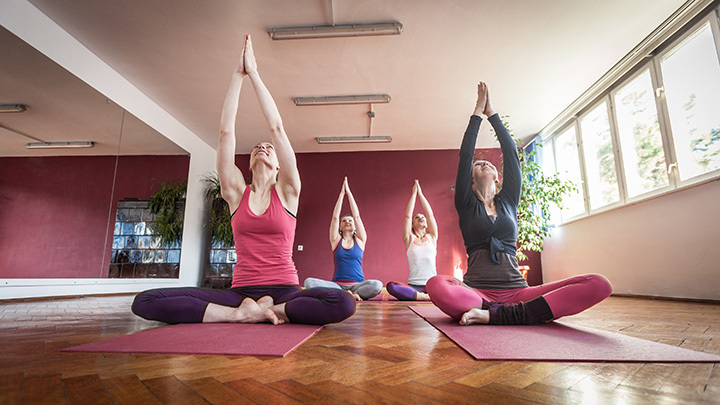 Teacher training, retreats, babysitting, new student discounts, and a robust class schedule make East Meets West yoga studio a highly-rated studio in Western New York. Liberation Yoga & Wellness offers varying levels of vinyasa, hatha, restorative, prenatal, and chair yoga (for those in wheelchairs who want to benefit from yoga). The holistic yoga studio also offers teacher training, reiki, massage, acupuncture, and other therapeutic services to improve mind, body, and spirit. Voted the “best yoga studio on Long Island” this year, Revolution Yoga earned this honor by offering a diverse array of yoga and wellness programs, including beach yoga, Reiki, office yoga, Ayurveda, teacher training, massage, “Mommy & Me” classes, and more. Dark, candlelit studios and clean, streamlined décor create a SoulCycle-esque vibe at Pure Yoga, which is among the most luxurious yoga experiences in New York City. The Equinox-owned facilities allow you to completely unwind and shut out the noise of the city. A peaceful, sun-drenched space, Catskills Yoga House in Chichester hosts everything from hatha and vinyasa flow to meditation, toddler yoga, and prenatal sessions. The Hudson Valley yoga studio welcomes students of all levels and abilities.